After a great program, the group is on board their flight back to Newark. Feel free to call us at 303-679-3412 with any questions! ​Thank you for your trust and support of the program. We just finished our final reflection and are heading off to sleep. We will send an email update in the morning, but please plan to arrive at Berkeley Carroll at 8:30 PM tomorrow, Tuesday, March 21st. Monday was our last full day in Sarapiquí. We began by visiting the community's schools where we have contributed to different construction projects. 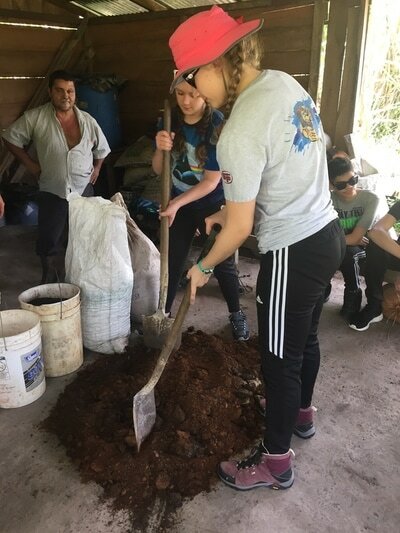 We took a tour of the Chilamate school and got to work! We then cleaned up, had lunch, and when rafting in the river. I felt like for me this day really brought me closer to my homestay family, Tess, Janey and Felix. In the morning my homestay mom came to check on me and to see if I had been feeling better being that the previous night I had been quite ill. She was so kind to me and truly treated me as if I were her own which I greatly appreciated. Later that afternoon we had an adventure race and I was in a group with Felix, Tess, and Janey. We had to do a group rafting activity and together we worked so well together engaging in activities I never would have before and I’m so glad I got to work through these scary challenges with such amazing friends who I am now closer with for which I am so thankful. Our Saturday in the community was very productive! 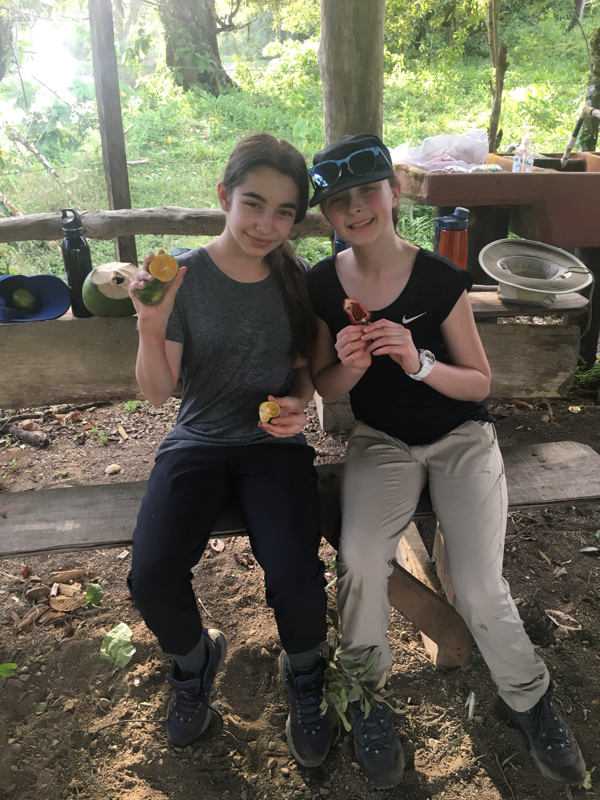 We started off playing soccer, took a dip in the river, went zip-lining, met our home-stay families, and went on a delicious chocolate tour. 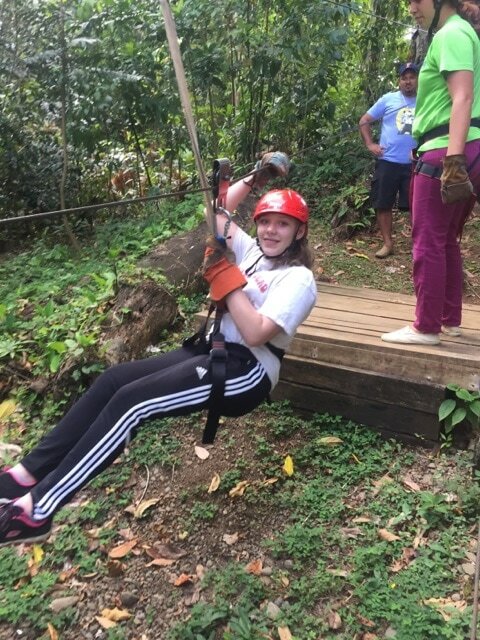 We're certainly making our days count here in Chilamate! 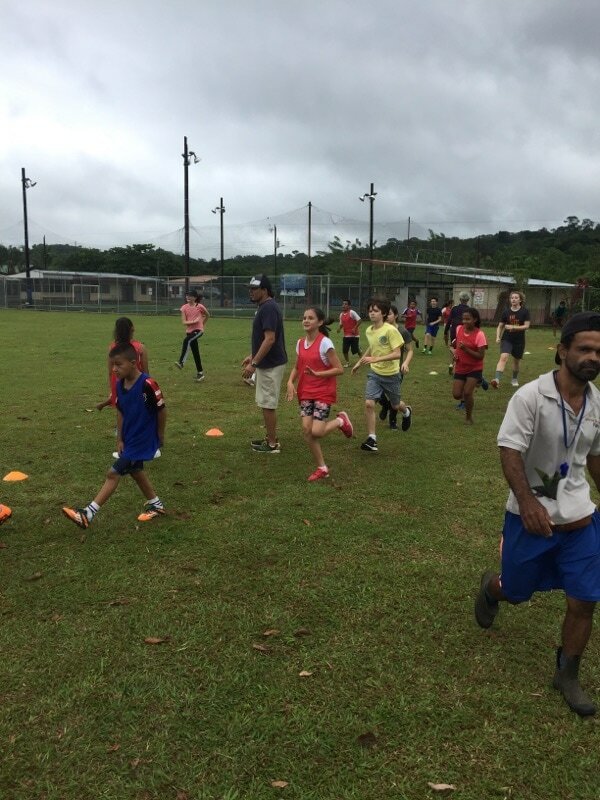 First thing: soccer with the community kids! 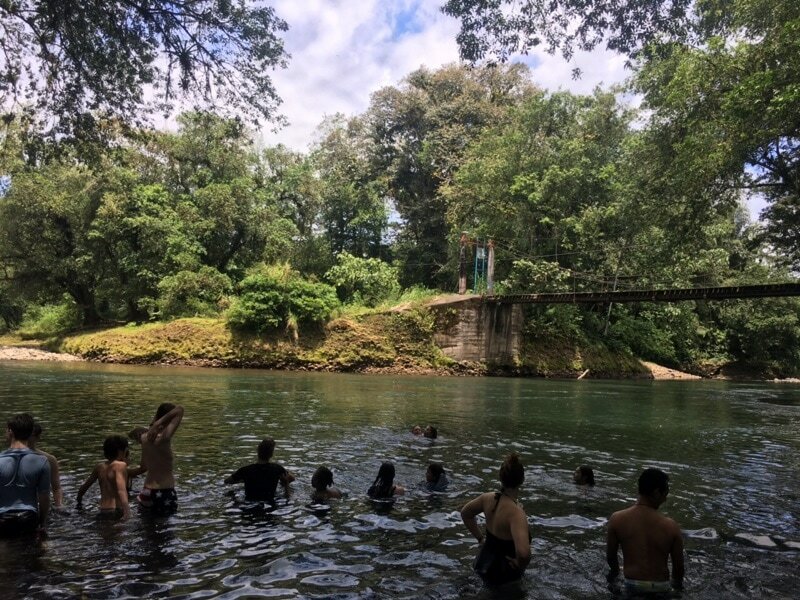 Students enjoying a dip in the Sarapiquí river after a very active morning. 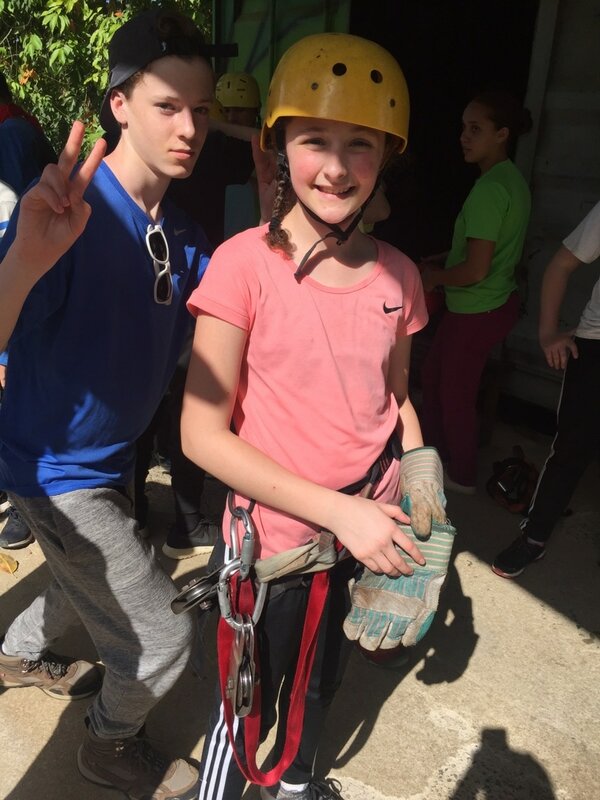 Tess and Henry getting geared up for zip-lining! Warming up for the game! 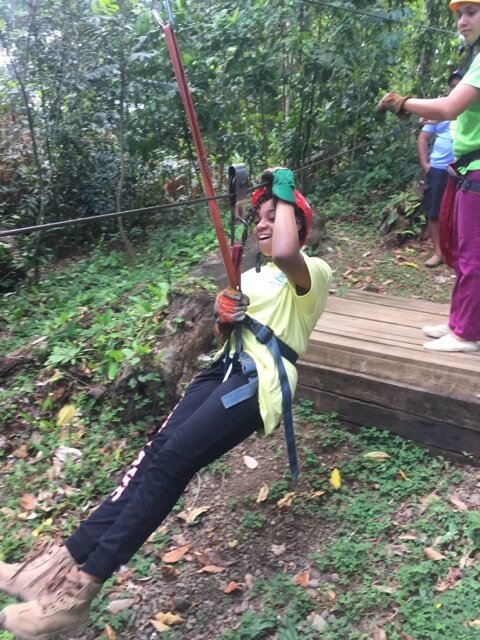 Brandon zip-lining over the river! (Andreas) Today we woke up at around 5:00 and headed out of the hotel in a van, heading for Sarapiquí to start the bulk of our trip. We all enjoyed the heat and cool breeze that the Costa Rican climate had to offer, especially after a freezing couple of days back in New York. Our tour guide, Walter, stopped the van at a beautiful waterfall that jutted out from high in the rocks. Walter told us a short history of the waterfall. We all swiveled our heads around to get a better view of what was outside, and someone eventually decided that they were pineapples. “Wait, don’t pineapples grow on trees?” a voice asked from the back of the van. We arrived at the farm at around 9:00, but it felt like the day was almost over because we had waked up so early. Our itinerary didn’t to care much though, as a multi-hour tour was waiting ahead of us. 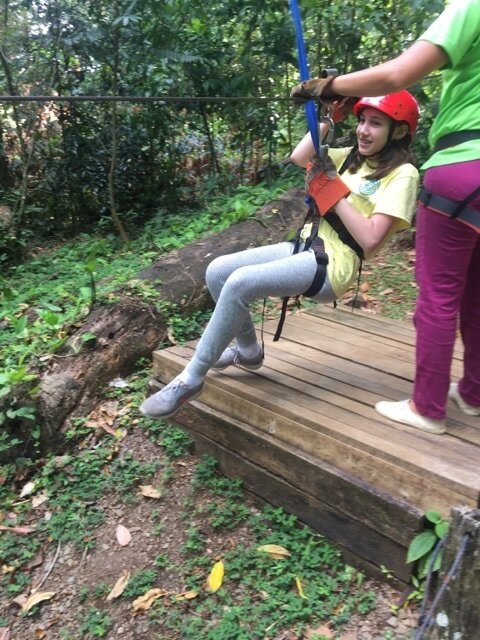 Luckily, it was one of the most interesting things that I have ever done. We started by feeding the pigs. 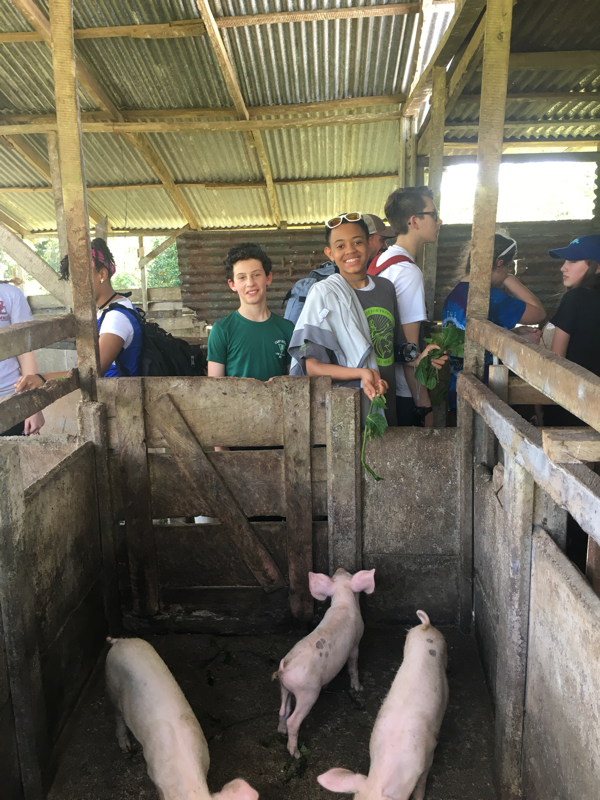 Daniel, the owner of the farm, led us up a path and to the pigpen, where a gigantic pig was waiting hungrily, hooves hanging over the fence. Daniel handed us a each a stalk of a special plant he uses to feed his pigs. We next went to a nearby shelter, where there were six bags waiting for us. Horse poop, cow poop, pig poop, chicken poop, calcium, and phosphorus rocks. We poured each bag onto the ground in front of us and created layers of each. Then we used shovels to break down the pieces and them mix them together. In this way, we created fertilizer that had all the things plants would need to survive. The next station was the pepper competition. Pepper is grown on vines, and each vine is curled around a tree or wooden post. We walked to a whole field filled with these plants, most of them unripe. The way we were able to tell which were ripe and which were not is if at least on of the peppers on the stalk was red or dark. We separated into three groups and raced each other to find as many ripe peppers as possible (side note: my group won). 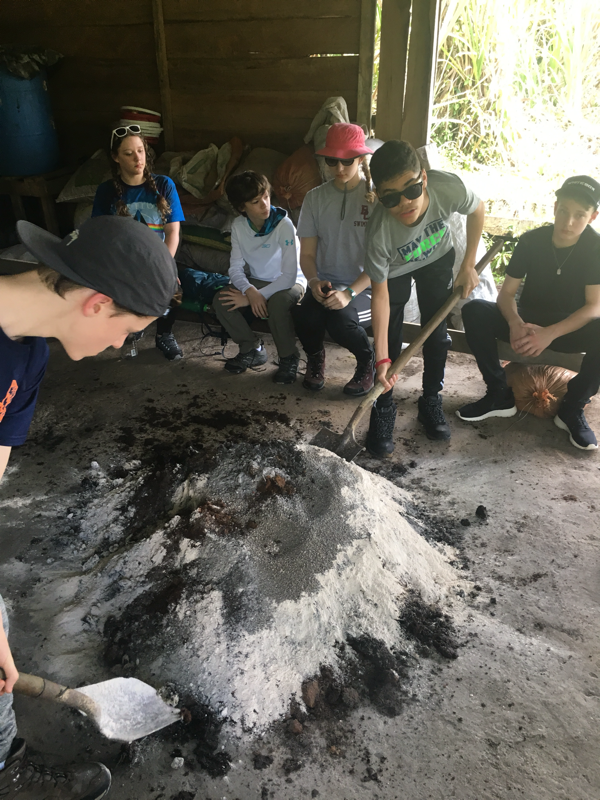 After that we visited vanilla bean plants in the forest, and then went to the biofuel place, where they used poop to create food for the house. We then ate in the house, and it was incredibly delicious. Our afternoon was greeted with a very friendly man named Jaime. Right from the start, he was very welcoming, a trend we've been noticing with everyone we meet here. 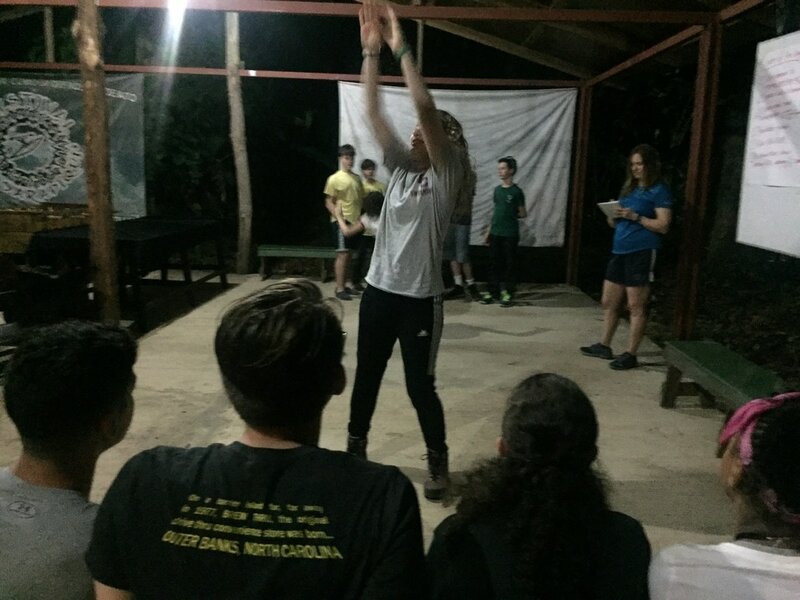 We began with a jungle hike, where we saw monkeys, poisonous frogs, four hundred year old vines, and more. After, we took a walk over to Jamie's house, and started our session with ethnobotany. Jaime began by passing around leaves from his garden and having us smell them and taste them, explaining the uses and the history behind it and often throwing in some very funny jokes. One big hit was the lipstick plant, a bright red fruit that you could put on your face. Jaime also had a machete, and we gave him coconuts for him to slice open for us. The juice was absolutely delicious. Overall, my first day was absolutely incredible. 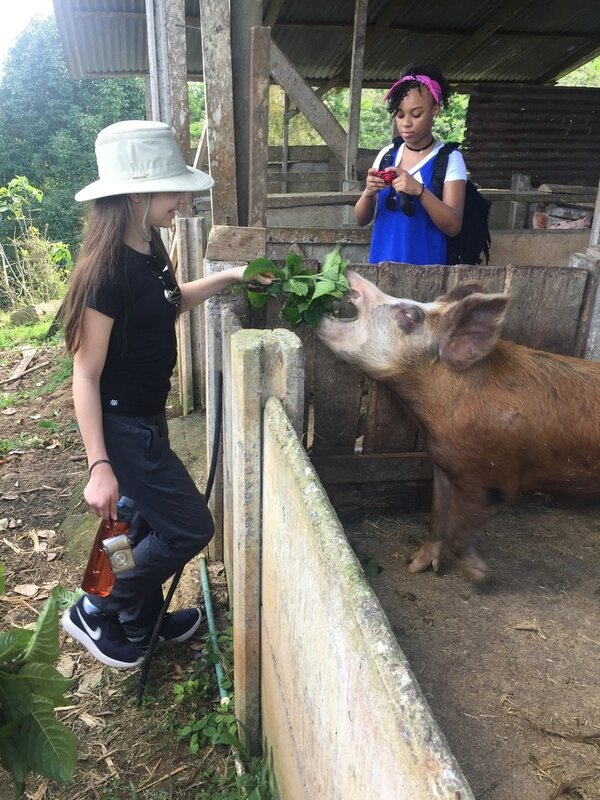 I was amazed at how much Spanish I could understand in our interactions with local Costa Ricans. 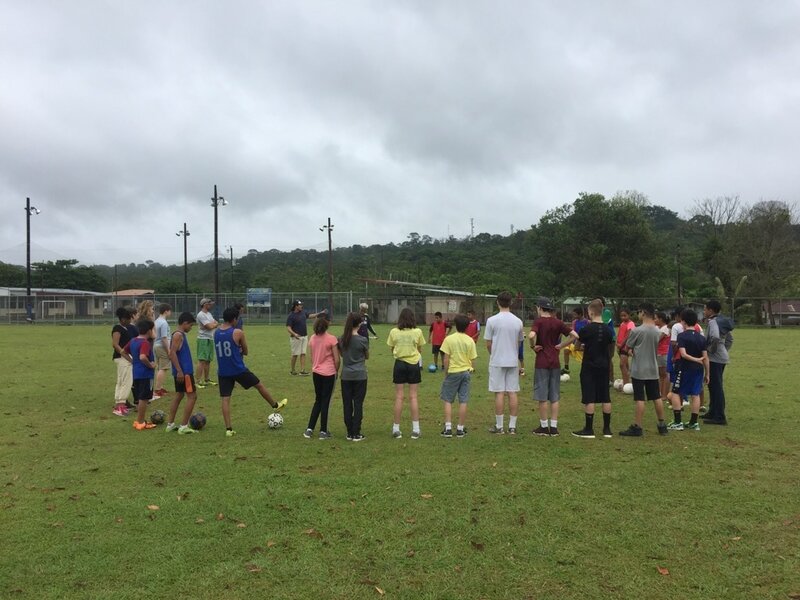 I'm already feeling at home, and looking forward to the next two nights with my homestay families. 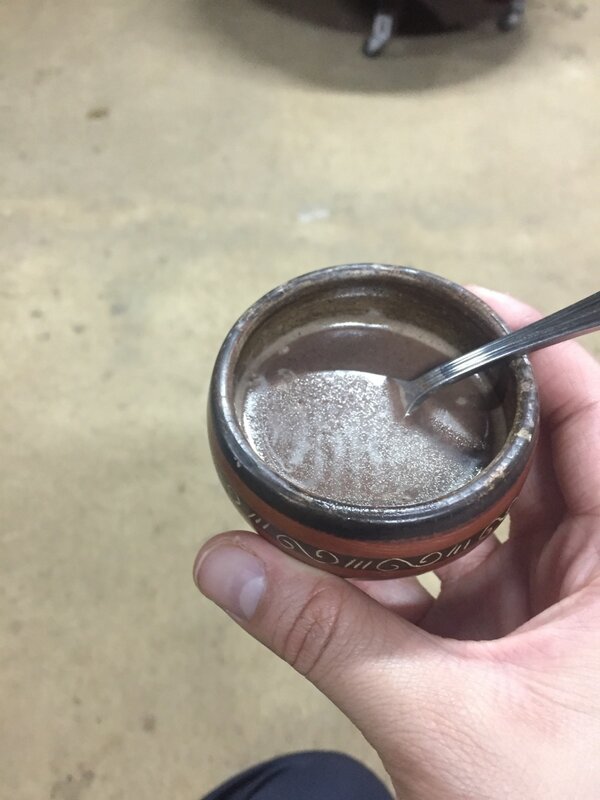 ¡Pura vida! We just arrived at our hotel and had a wonderful introduction with Walter, Lauren and Pablo, our WLS leaders. We're off to get some sleep before a very busy day tomorrow.